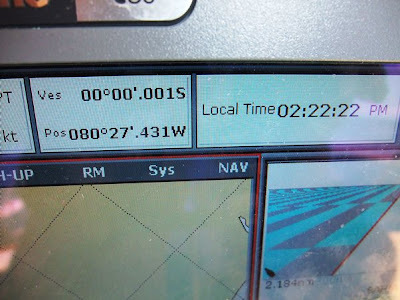 We crossed the Equator three times (2 southbound and 1 northbound) to try to get the chartplotter to show exactly 0 degrees but this is the best we could do. Ainia will be in the Southern Hemisphere for the next 16 months at least. Once Ainia was safely moored in Bahia, Ecuador, our plan was to become backpackers for 3+ weeks in Ecuador and Peru. We were not sure how this work out since our impression was that the median age of backpackers was about 25. In any case, this was the only way that our budget would allow us to travel inland for any length of time. It would also be a trial run for possible land excursions in other parts of the world. 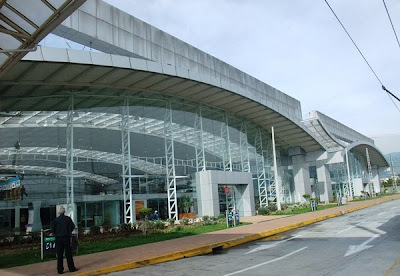 Our first destination was to be Quito and because we were being extra careful we went to the local bus station (Terminal Terrestre – my apologies for Spanish misspellings) two days early to get tickets. We were told we could not buy tickets until the day of departure – or at least that is what June thought he said. The day of departure we loaded up with all our gear – a good backpack with hip straps for a heavy load, a gym bag which could be carried on the back, since we did not have a second backpack, and a day pack to take on the bus with a computer, passports, medications, guidebooks, camera, etc. We arrived at the TT more than an hour before the bus was to depart and were told a) all the seats were taken or b) the bus had been cancelled. June’s Spanish skills improved dramatically in the next few weeks but they were not very good yet, but it was clear that we were not taking the Reina de Camino bus to Quito. (BTW, there are dozens of bus companies in Ecuador and Peru. It appears that the best companies buy new buses and sell their old buses to second-level companies who, in turn pass their buses down to the next level.) Several people heard the discussion about us wanting to go to Quito so they told us to come with them and we could take a local bus to a town called Tosagua and catch a Quito bus there. The Tosagua bus was not very impressive, they had a big rock behind one of the tires even though the lot was pretty much flat. We paid our dollar each (for a one and half hour trip – buses in Ecuador are incredibly cheap) and we were on our way into the foothills to Tosagua – at least that is how I think it is spelt. Even though it was a fair-sized town, and had its own bus line, it did not appear in our Lonely Planet guide, perhaps we were the first tourists to ever go there. The helpful driver and conductor on our bus stopped at the Reina office in Tosogua and we soon had our Quito tickets in hand with nothing to do but sit outside the office for an hour or so and watch the world go by. June’s impression was that Tosagua was very much like a provincial town in Western China – very busy and dusty, with small trucks and tricycle taxis (built on a motorcycle) everywhere. We could not tell if the main street was mud or paved with a layer of hardened mud on top. On time, our next bus came and we were on our way. Tosagua's best days as a tourism mecca lie somewhere in the future. Our arrival at Quito’s grand new bus station quickly showed us that we were in a different place entirely from either Bahia or Tosagua. It is very much like an airport with bus arrivals on one level and departures on another. In total, there were something like 100 departure lanes. It put to shame any bus station I have seen in North America – perhaps not surprisingly since intercity and intracity buses are so important here. This shot gives only an idea of how grand the bus terminals are in places like Quito (here), Guayaquil, and Panama City (and not Lima which does not have a central terminal). Bahia had been typically hot and sunny with a fair bit of humidity. Quito on the other hand was pleasantly cool and sunny with daily highs around 23C. The reason was simple. Quito is at 2800 m as we noticed when we had to walk to the third floor of the building where one of June’s friends lives carrying luggage. Unfortunately, Willy was in China on business but he had arranged for some of his friends to show us around. They could not have been more accommodating and helpful. Over the next few days they showed us around this beautiful and unique city. I am not aware of another major city (~2+ million people) that is linear in shape. It is something like 60 km long and only 6 km wide. The reason is that Quito lies in a large valley between ranges of volcanic mountains, most of which are over 4000 m with some over 5000 m. (Not too far from Quito there are snow-capped mountains over 6000 m.). Quito’s strange shape means that it neighbourhoods appear next to each other as you travel its highways and mass transit system – three parallel busways. 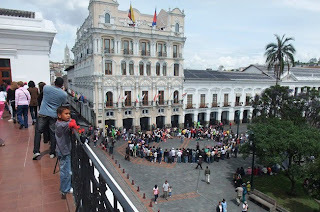 The highlight of our Quito visit was going into the historic center of town both during the day and in the evening. The people of Quito are immensely proud of the fact that it was the first UNESCO World Heritage Site chosen. The reason for the selection is obvious. The Old Town has had little of its character lost due to fires, earthquakes, and urban development. The public areas are exquisite and the churches incredibly ornate and remarkably numerous. As with so many of the Spanish colonial cities we visited they are very old – the oldest church dates to 1570. We even got a tour of the president’s palace (more on politics later). 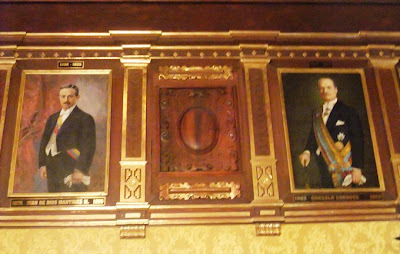 In one grand room they had portraits of all of Ecuador’s presidents except that the current president has taken down those of tyrants (by his definition one assumes) and temporary presidents – eg those appointed by the military after coups. It is odd to see gaps in the row of paintings – it would make sense if they moved the portraits along to fill the gaps but perhaps I am missing a message somewhere. 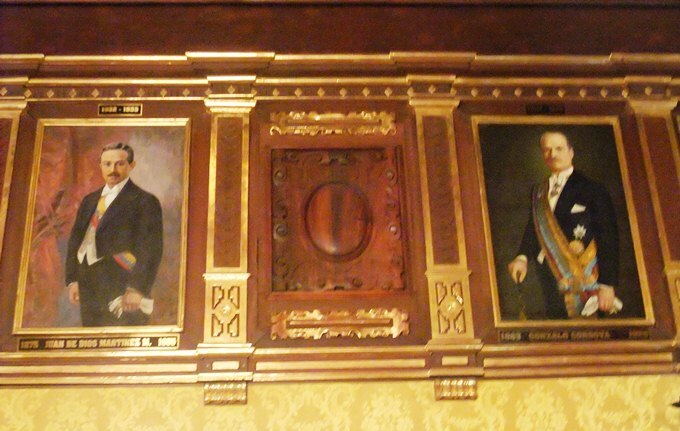 Inside the President's Palace. Not sure what the guy in the middle did to get his picture removed. 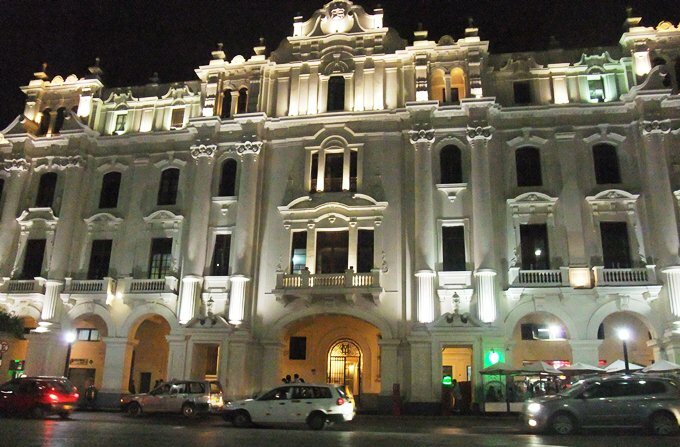 Cities in Ecuador and Peru were fascinating combinations of modern and traditional. Most indigenous people dress in traditional clothing. Not to make this narrative longer than necessary, some shorter comments about other places that we visited. 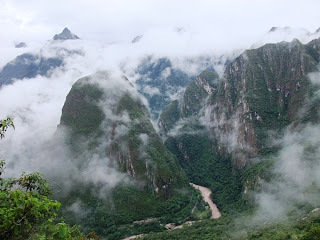 · Tena is on the eastern side of the Andes where there are numerous rivers that are part of the Amazon system. The bus ride from Quito was wonderful, but slow as all buses in the mountains are. We went whitewater rafting here down a river in a gorgeous canyon with waterfalls and vines hanging down and masses of beautiful butterflys. We were reminded of the fact that we were in the Amazon when, at one point, an anaconda slipped into the river from an overhanging tree. · Banos was another gorgeous bus ride to a very touristy, pretty little town that exists because of hot springs. Here we visited the hot springs and had a cheap, but not very good massage. · Riobamba, we stopped here, along the Pan-American Highway, not for any touristy reasons but only because of the time of day. We stayed in a lovely little hotel and got a chance to visit the enormous, and fun, market that takes over the downtown every Saturday morning. You can buy anything from furniture to flowers (and a lot of things that don’t even start with ‘’f”). 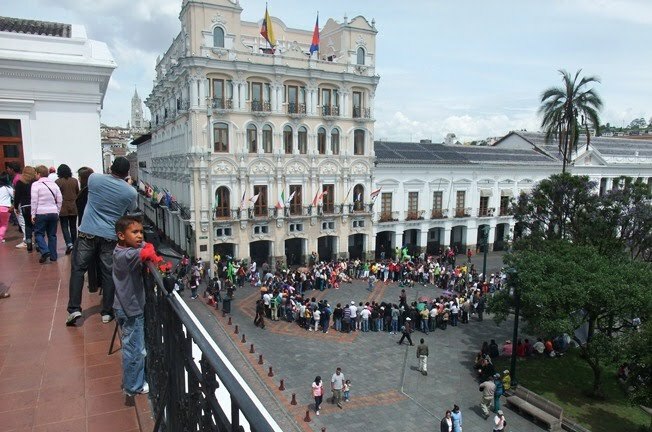 · Cuenca is Ecuador’s third city, but only in size. It is quite isolated in the south of the country and is a center for culture and learning (there are several universities). We found it quite cosmopolitan and charming and have decided to revisit it at some point. These are indeed guinea pigs on the barbie. 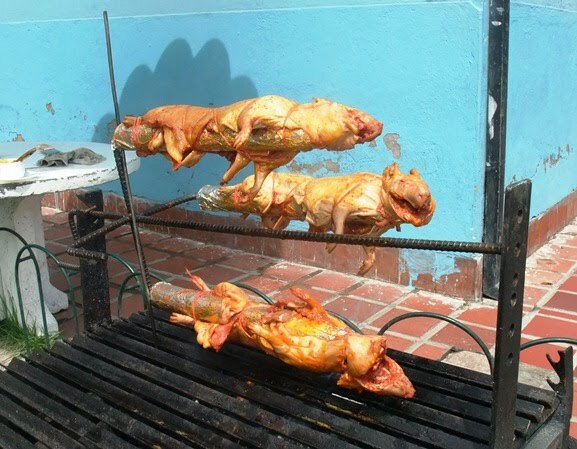 'Cuy' are an Ecuadorean delicacy and quite pricey. We did not try them. On to Peru – The places we wanted to go were all in the south of the country so we had something close to 24 hours of buses from Loja. 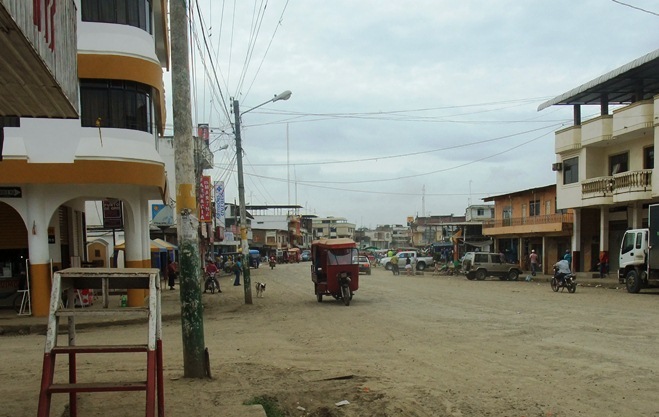 The border crossing we used was entirely civilized and easy unlike the one along the coast near Tumbes which is in quite a frontier town kind of place. · Piura. We did not spend the night - just long enough to buy tickets for the overnight bus to Lima. It has an incredibly busy downtown area in the evening with the streets jammed with people and cars. · Lima is a unique place because of its vitality and size (11+ million people). Other than walking the streets a lot, the only touristy thing we did was visit the National Museum. They had an excellent, very detailed display about the troubles the country had between 1980 and 2000 when two terrorist groups combined with a repressive military and police to kill almost 70,000. While one of the groups, Shining Path is fairly well-known in North America, the enormous death toll certainly is not. The display is part of the truth and reconciliation process and was most impressive. We also walked around the downtown quite a bit and went to “Chinatown” for dinner. It was an excellent Chinese dinner (even to an expert like June) but none of the people involved were Chinese and there was no Chinese menu, only Spanish and English. We also had our worst hotel here, the Hotel Belen Annex, which is, according to Lonely Planet is better than the main Hotel Belen (hard to imagine). The hotel is across the street from one of the main public squares in a building with an exquisite exterior that is floodlit at night. We did not expect the room to be nearly so impressive (a similarly-positioned hotel in Quito had rooms, all suites, starting at US$500 a night). The good news was that we also had a suite with a large living room and a wonderful view of the square – the bad news was that it was a dump that looked like it had not been renovated in 40 years. There was no cold water in the shower and the hot water was generated by a bizarre device on the shower nozzle that looked to have been wired by someone who had no real clue about safety (and this was 220v). We left the water heater off and moved to a different hotel in the morning. It was quite nice except that it was housing two delegations of high school students – one from Chile and one from Mexico. Let’s just say the accompanying teachers were not impressive in their management skills. You too can stay at the Hotel Belen Annex (an unretouched photo) for only $22 a night. Our room was on the third floor just to the left of the window with the columns. There is a reason why all the rooms are dark! 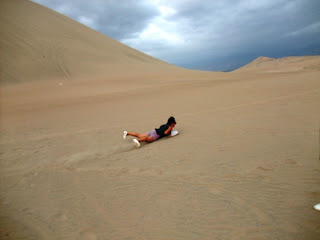 · After Lima we travelled to a tiny place called Huacachina. This looks like a 1940s’ Hollywood movie impression of a desert oasis. There is a tiny village (perhaps no one actually lives there, it may only be hotels) around a small lake surrounded by the largest sand dunes in the world, certainly close to 100 m high. Why the sand does not just cover up the village and the lake I have no idea. There certainly is enough sand to do it a hundred times over. We came here for a ride in a powerful, 10 passenger dune buggy and for sandboarding. They use rather large and heavy versions of snowboards. A few of the people in our group who were snowboarders tried this standing up but with little or no success. Most of us, including the real boarders, just did it lying down. The hills were very long and very steep but the friction was quite high so you went fast but not insanely so. If it had been snow it would have been very dangerous. After each trip down a dune, the driver, who was excellent in combining thrills and safety, drove down to pick us up and take us to the top of the next dune he had picked out. The whole excursion only cost about US$15 per person so it was a great deal. June takes off down the dune. It was much steeper than the picture shows. 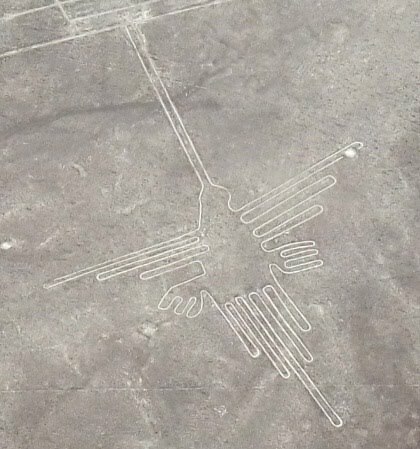 Nazca and its famous lines was our next stop. We should have known better and fell victim to one of the local touts who makes his money getting tourists to buy flights from him (he said he was one of the pilots and they needed two more people to fill a plane. He wanted US$150 per person and June got the price down to $90 but I think we still overpaid a bit. In any case, the flight was fun and the lines are fascinating to be sure. While the shapes (monkey, hummingbird, astronaut, etc) are neat to look at, I found the numerous, and very long, straight lines most interesting. They are everywhere and you wonder why they would have bothered with them. Suggestions are that they are astronomical or related to water supply but there is no general acceptance of these theories. While we were here we also went to the local museum which was quite good. We also learned that the Naxca peoples built underground aqueducts to bring water from natural aquifers to their fields and villages. We saw one of these that had been partially uncovered – they are a remarkable achievement but get little attention because of the lines.. BTW, many of these aqueducts are still in use. One of the famous Nazca lines, the Hummingbird. You can see nothing of them from the ground but from a small plane they are quite vivid, although air sickness is common (not on our plane) as the pilots zig-zag over the ground. 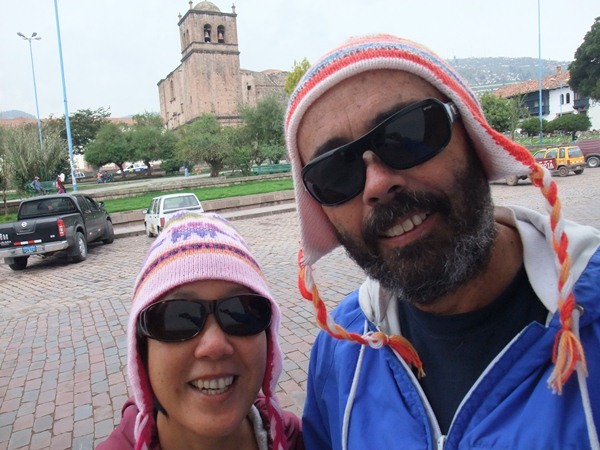 · Cuzco – A long overnight bus ride (that turned out to be longer than expected), that went over 4000 m, brought us to Cuzco. The longer than expected part was because our bus broke down. Originally we were to leave Nazca at 1130 pm but the bus company had an 830 departure so we switched. The only problem was that the early bus broke down about 5 hours before Cuzco. The late bus came along and took as many people as it could, but left about 10 of us to ride in a mini-bus which made our trip about 21 hours in all. This in spite of the fact that we had chosen to go on the fanciest, most expensive bus line Cruz del Sur. They advertise their reliability and punctuality – arggh! What bothered us most what there was no apology given for the problem (and yes I know that mechanical failures happen). Poor customer relations from a company that goes out of its way to say how wonderful it is. 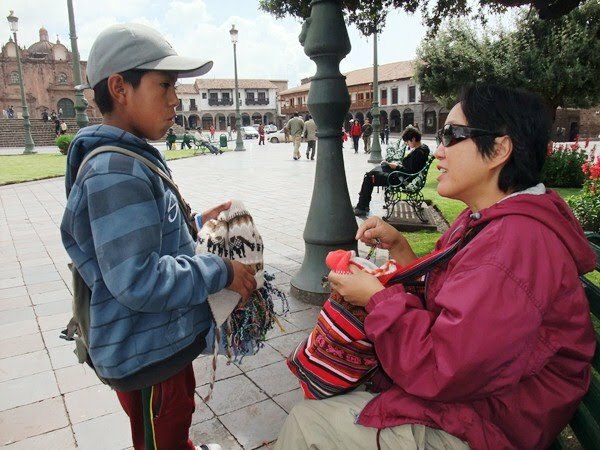 Cuzco is another lovely, colonial city and quite cool since it is over 3300 m. It is the center of much tourist activity including visits to Macchu Pichu (MP). We had a very nice backpacker’s hotel here, the only problem was that it was up a pretty serious hill from the square in the center of town and we had been back to sea level for several days after our time in the mountains of Ecuador. We did not have to use our altitude sickness meds, but there was some huffing and puffing going on as we lugged our gear up the hill. The other downside of Cuzco was the constant attention of street merchants and beggars (see income differences below). To visit MP you have a number of options. The first thing you realize is that there is a reason that the Spanish never found the place – it is really remote. You first have to get to a little town called Aguas Caliente to which no roads go but through which a railway passes. The railway was built before the existence of MP was known to anyone but a few locals and passes within a few kilometers of the site. So, you need to take a train. At one end of the cost scale, you can take the ‘Hiram Bingham’ (named after the Yale historian who ‘discovered’ MP a century ago. It is a day trip that will set you back something over $600 but is quite luxurious. At the other extreme you can travel using local buses and local trains that take workers into Aguas Caliente. This is a minimum three-day trip and would set you back less than $100 not including meals and accommodation (perhaps $200 total). We went the second cheapest way which is to take a shared taxi or colectivo ($4 /person) to a lovely village called Ollantaytambo (which is not pronounced as you might think). Ollanta, as it most commonly called, is quite historic in its own right. There are high mountains all around a narrowing valley (called the Sacred Valley) with significant Inca ruins on two sides of the valley. In fact, Ollanta was the locale of one of the most serious Spanish defeats during their conquest of the Incas. Ollanta is also the departure point for scenic tourist trains to Aquas Caliente. Depending on the train and time of day, these cost about $35 to $45 each way (the local train, coming from the other end of the valley is about $15 for tourists and less for locals). The train ride is stunning as the valley narrows and (in the rainy season) the river becomes quite wild with almost continuous huge rapids for many kilometers. Apparently last year the river undermined part of the railbed and hundreds of people had to be evacuated by helicopter. It is easy to see how this could happen since the valley is so tight and the river so wild. There were several places along the route where erosion control measures were being built. Once you get to Aguas Caliente you need to buy your tickets for MP (about $50 each) and bus tickets to get you to and from the site ($15.50 per person for a trip that lasts about 20 minutes). Needless to say, MP is a major contributor to the GDP of Peru and provides hundreds of jobs. 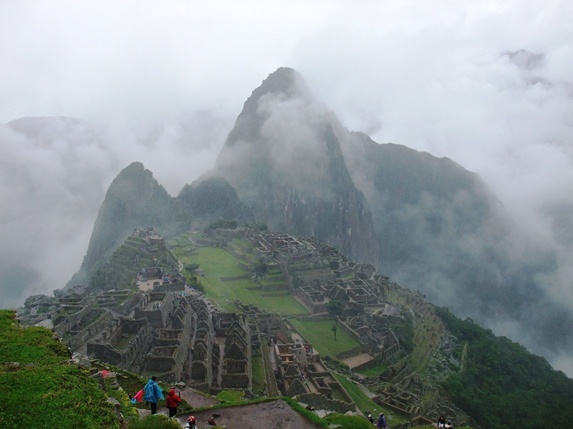 A fairly standard view of Macchu Pichu, although most pictures are taken in the dry season. All the hassle and expense is worth it when you finally reach MP. We are all so used to seeing the same image of the place taken from one vantage point that everyone goes to that it is easy to lose sight of the fact that there are stunning vistas in every direction. 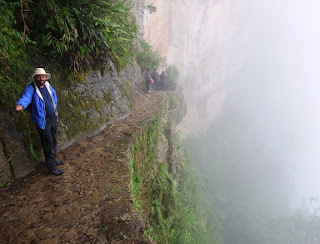 This was particularly the case when were there since there were misty clouds floating into and out of our line of sight. I know that the archaeologists have a number of theories about why MP was built, but to a lay-person what is most apparent is that the Inca must have had a different way of thinking about the land to have a chosen such a location for any purpose other than its beauty. To my way of thinking, this had to have been built as an easily defensible retreat for the royal court. Part of the 'easily defensible' nature of Macchu Pichu. Barely visible in the background is a 'bridge' of planks whose removal would make this trail impossible. The view into the valley from Macchu Pichu. Aguas Calientes is upstream a few km. 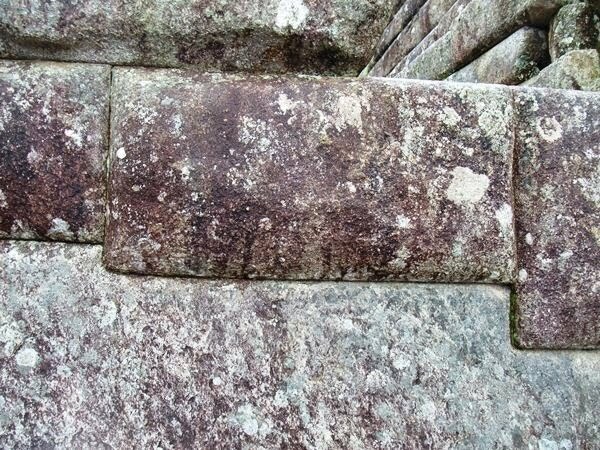 The stone work in Machhu Pichu is remarkable. Note how the lower block has been notched in two places to lock the wall together - and all with stone tools. After MP it was back to Cuzco to catch a flight to Lima. To give you some sense of how hard travel is in the Andes, particularly going east-west, the flight was less than 1 ½ hours, while the bus ride is almost 24 and could be longer in the rainy season, unless you took a more reliable route through Arequipa, further south which would have been 27 hours. Another reason for skipping a bus trip was that we were scheduled for a 26 hour overnighter to Guayaquil, Ecuador which would get us almost back to the boat (only 5 more hours on a not so fancy bus). Buses – Buses in Ecuador and Peru are crucial parts of the infrastructure since private cars are still relatively rare and air flights are costly and only go to a few places. There are luxury bus lines in Peru (Cruz del Sur and Ormeno come to mind) that cost a lot more but have newer, more comfortable buses that are nicer than any buses in North America. They all seem to be built in Brazil on chassis made by Mercedes, Scania, or Volvo. Both companies were advertising buses that go as far as Caracas and Bueos Aires. Some of these trips would be 70 hours or more. Cruz del Sur makes a point of security by checking passports at every opportunity and videotaping or photographing you as you get on or when you are in your seat. I think this is to make the all-too-common bus thieves choose another company. In Ecuador the buses are not as fancy but remarkably cheap (think $1 per hour) and they go everywhere with great regularity. There are dozens of bus companies that all seem to be cooperatives that operate within one region or between one region and the metropolises Quito and/or Guayquil. Both cities have wonderful, modern bus terminals while most, smaller cities and towns, have much simpler terminals. This may reflect the enhanced role that government plays in Ecuador since most cities in Peru, including Lima do not have a central bus terminal, Often, but not always, the bus companies are close together, but in some places you have to take a taxi between companies. Buses of all sizes and shapes are also vital within cities. Generally they cost about 25 cents and take a bit of practice to figure out where they are going. In Lima we could not find a taxi that wanted to go to the downtown area from the national museum (traffic issues I think). The ten lane road we were on had buses going to many places but eventually we found the one we wanted and had a different experience of the city. All buses, even smaller ones have both a driver and a conductor so you have someone to talk to without distracting the driver (see below). Quito, Guayaquil, and Lima all have bus-based rapid transit lines that seem to work very well moving masses of people at a construction cost that would be a fraction of that of a subway. Drivers – If you come to this part of the world do not, for a single moment, think about renting a car. Buses go everywhere and taxis are not expensive. Drivers here have little use for Formula 1 car races (let alone demolition derbies) since they know that they are better drivers than Lewis Hamilton or any of them. They pass on blind curves in the mountains where guard rails are few and far between and the views are associated with precipitous drops. There are little crosses and other monuments next to the road everywhere (including the precipitous drops mentioned before). These are all made of concrete so they last. I have one question though – is it a good idea if your cab driver crosses himself every two minutes or so? It may mean you are connected or it may reveal a certain lack of confidence. Lane markers seem to be somewhat pointless here as well. If there are four marked lanes, there will be at least five lanes of traffic. Hotels – We used the hotel recommendations from Lonely Planet and they were (with the exception of the Hotel Belen Annex mentioned above) quite reliable. We tended to stay in the budget category, only occasionally moving into the lower part of the midrange. We always had a private bathroom, except when our hotel in Cuzco messed up for a second night there (after a night away at MP). We paid from $17 to $27 a night and the hotels were routinely clean – sometimes plain and sometimes quite nice (eg in Tena). In these sort of hotels you tend to get to know other guests and the hosts much more than in typical North American hotels. We very much enjoyed this type of travel and will look for opportunities to do it in the future. Politics – It was fascinating to observe the politics of the two countries in action. Peru is in the midst of a presidential election (they seem to go on for more than a year). In the cities the richer candidates have fancy billboards but in poorer areas election advertising consists of paint on whatever walls are available. In some cases, this means that the sign may be 50 m long. Presidential candidates (there are 14!) have congressional candidates associated with them. You can vote for the name, a number, or a symbol for the party/presidential candidate. Some of the symbols are just initials from the candidate, but we also saw a tree, a soccer ball, a shovel, as well as initials. A president can only serve one term at a time and then must sit out at least a term (5 years) before running again. That means that Alan Garcia, the current president (and president in the 80s) must step aside. The frontrunners seem to be Alejandro Toledo who was the president before Garcia. He is interesting since he was the first indigenous person to be president and also taught economics at Stanford. Even more intriguing is his main challenger, ‘Keiko’. All the signs just say “Keiko” or have a “K” symbol, but she is Keiko Fujimori, daughter of former president, Alberto Fujimori who is in jail for 30 years for corruption and “extra-judicial killing” (think death squads). She has said she will pardon him if elected. Goal in this election is to finish in the top two since, if no one gets a clear majority (50%+1) then a run-off will be held. I wonder if some of the minor candidates are there to position themselves for a good government post when they throw their support behind one of the two front-runners. Something else to keep in mind is that I am judging strength only from signs which require money. Garcia’s party, APRA, is the party of the poor, and their candidate may have a lot of support even though they do not have many signs in much of the country. The situation in Ecuador is quite different. They have a president, Correa, who won a second term last year. This is quite rare in a country where some presidents’ time of office has been measured in days or weeks. In fact, Correa is trying to have the constitution changed so he can keep running. Correa is from a rich background but is a populist. His time in office has been marked by considerable spending on public works, education, and health care. Also, staples are heavily subsidized (diesel ($1.02 per gallon), cooking gas, vegetable oil, etc). Also his government seems to have hired many people to do low level jobs – for example, the country is very clean as lots of people sweep the streets, collect garbage, and mop the bus station floors (that they mopped only a few minutes ago). He also seems to be an honest man in a government and country where corruption is traditional. People seem to love him (the majority, especially the poor) or loathe him (the wealthy). The question will be, can he keep the money flowing to support his programs? Ecuador exports a lot of oil but may have to allow drilling in national parks to maintain these exports in the medium term. Correa’s opponents compare him to Chavez in Venezuela and Morales in Bolivia as populists who could not maintain their original direction because of ego (Chavez) or because the money ran out (Morales). Only time will tell. Taxis – There are many kinds of taxis in these two countries. Bahia even has bicycle taxis (an environmental thing). In general, the lowest level taxis are three-wheelers – think motorcycle with the back wheel replaced by a seat for two and a small storage box. These seem to have been imported from China and India. You only find them in smaller towns and the outskirts of cities since they cannot keep up with normal traffic. Next up the list are little Dae Woo taxis. I am guessing these little boxes about 1000 cc engines and are very cheap and tinny. I would not want to be in an accident in one. They sometimes have massive spoilers on the trunk which is a hoot considering. More modern taxis are often Hyundais or Toyotas and are usually newer and in better shape. In some cities, Guayaquil is where we ran into them – there are non-registered taxis. Basically these are private cars that you can flag down and you just ask the driver if he wants to take you to your destination. Wealth differences – Latin America has always been famous (or infamous) for the great wealth disparity that exists. In fact, some book research I had to do indicated that Ecuador was one of the worst with Peru not much better. In Ecuador, the richest 10% of the population control 44% of the country’s wealth (In North America and Europe this would typically be between 20 and 30%). The result is that these countries have no middle class. There are a small number of wealthy people and a large number of poor people. This was particularly evident in Guayaquil where we visited a large, high end shopping mall where you could buy Hugo Boss, Armani, Tag Heuer, Mont Blanc (a separate store). It seemed quite bizarre to find this in the developing world. We also visited a private beach club where the membership is $7000 a year. At the other extreme are the very poor. This seemed to be more of problem in Peru than Ecuador and we saw many people begging and trying to sell things that no one wanted to buy. Clearly Correa is trying to find a way to get more of the wealth to the poor. What might happen in Peru will depend on who the president is and on whether successive presidents have similar views about what to do about the problem. Child labour seems pretty common, at least in informal settings. June negotiating with this little guy in Cuzco. What happens after the sale is completed. The populations of the two countries consist essentially of three groups: a very small Caucasian group who are descended from the original Spanish, a very large mestizo group who are mixed race, Spanish and indigenous, and a significant indigenous population, in particular high in the Andes and in the Amazon basin. Levels of wealth follow these demographic patterns very closely. All of the members of the beach club that we saw were whiter than me and almost all of the shoppers in the mall were white. Those working in the club and mall were typically mestizo. 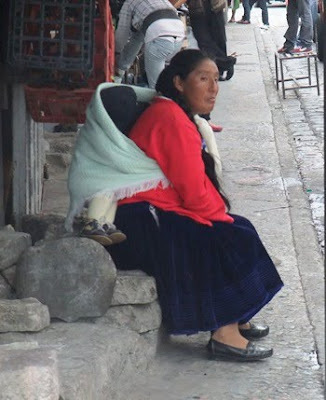 At the bottom of the heap, begging on the streets of Cuzco or coming in to sell stuff on the streets were the indigenous. Correa has the daunting task of trying to overcome these differences. In Peru, Garcia’s party is similarly positioned but it would appear that his successor (Toledo or Keiko in all likelihood) does not share this philosophy. Posted by Bruce at 1:03 p.m.